Description Development of a five storey building comprising four (4) apartments, a shop and a reduction in car park, as shown on the plans accompanying the application. Car stacker sump conflicts with land title restrictive covenant. Compromised internal amenity for 1 bed apartments A1 & A2. (clause 58). (3) Add you own unique objections. Keep them general and brief. (1) Print and or photocopy multiples of the resident letter (above), plans and objection form. (2) Walk surrounding streets. If you knock on doors you can discuss the proposal and get neighbours to sign the objection on the spot. Alternatively you can drop the information in their letterbox and follow up with a visit later. 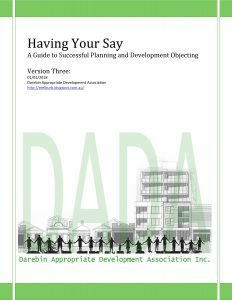 Dear Darebin Planning Please find attached an objection to this planning proposal.